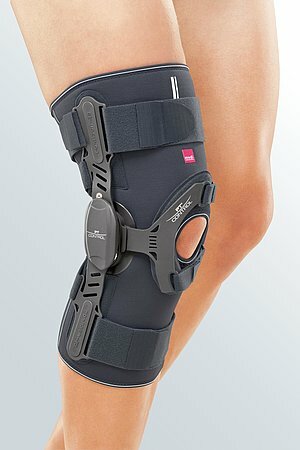 Collamed OA is a functional knee soft brace. 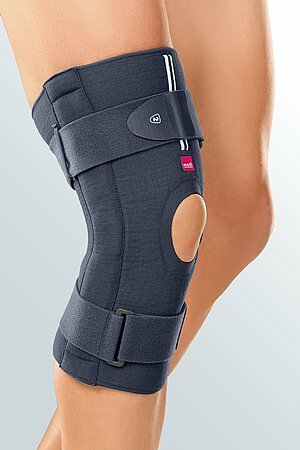 The product is exclusively to be used for the orthotic fitting of the knee and only on intact skin. 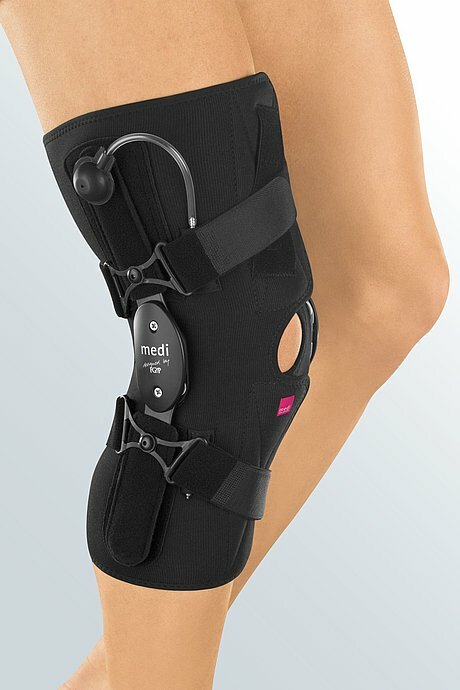 The physioglide hinge mimics the rolling / gliding movement of the knee and ensures a secure fit. Open the four straps completely and undo the upper and lower the hook and loop fastener. Make sure that the inflatable condyle cushion is correctly positioned on the inside of the brace and is fitted to the side opposite to the affected side of the knee joint. Sit on the edge of a chair and bend your leg to 45°. 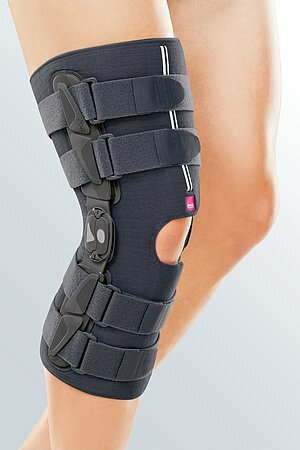 Put the brace on your leg from the back and close the two the hook and loop fasteners tightly. 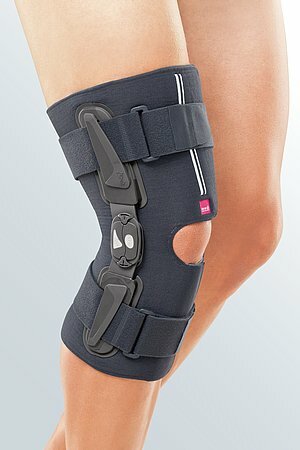 The kneecap should be positioned in the centre of the moulded recess in the brace. Position the brace joints so that the centres of the hinges (extension wedges) are level with the upper border of the kneecap. Make sure that the brace is not twisted on your leg. Now fasten the lower two straps, starting with the strap at the back. Then fasten the upper two straps, first the back one and then the front. Keep your knee bent and make sure that the hinges are still in the right position. Now stand up and move your knee gently a few times. Then tighten the straps in the order given above to stop the brace from slipping. The inflatable condyle cushion enables you to exert more pressure and thus relieve more pressure on the affected side of the knee. To inflate the cushion press on the white pump on the outside of the brace. To deflate the cushion press in the valve below the joint. The pump is connected to the air cushion with a plug-in valve and can be removed if wished. The fabric parts of the brace can be washed by hand at 30°C. Rinse it in clean water afterwards. Leave out to dry. Under normal use the brace is maintenance-free. However, after using the brace in water the hinges may be lubricated with Teflon™ spray. Check regularly that the joint screws are secure, tighten them if necessary.